A biopsy—most commonly from the breast—obtained with imaging (e.g., CT, ultrasonography)-based guidance. Stereotactic needle aspiration (provides cytology specimen); stereotactic core (cutting needle) biopsy (provides one or more cores of tissue). Less expensive than excisional biopsy; lower morbidity; no scar. Small but definite false-negative rate. Pathology A biopsy–most commonly from breast, obtained via imaging–eg, CT, ultrasonography-based guidance Types Stereotactic needle aspiration–provides cytology specimen; stereotactic core–cutting needle biopsy–provides one or more cores of tissue. Cf Guided wire open biopsy. 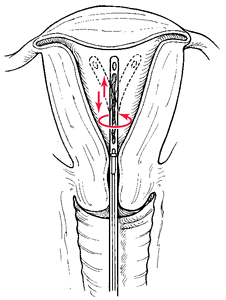 A biopsy taken by precisely locating areas of abnormal growth through the use of delicate instruments. 3] recommend that specimen radiography should be performed for all stereotactic biopsy specimens, to ensure that representative samples of microcalcifications are obtained. Stereotactic biopsy of intracranial space occupying lesions. Difficulties for the nurses and other care providers at this point included explaining that brain metastasis had been ruled out by the stereotactic biopsy and that JS had been diagnosed with a different diagnosis: primary CNS lymphoma. Today IMS is the only company offering the market a line of Digital Mammography units with the choice of an 18x24 or 24x30 cm a-Se detector and the only company offering the ability to perform a stereotactic biopsy on the same large detector in the prone position. 6] In addition to offering clinical accuracy, stereotactic biopsy is much less expensive than surgical biopsy. Contract Notice: Supply Of 2 Ultrasound And Stereotactic Biopsy Apparatus Divided Into 3 Tasks. The MAMMOMAT Inspiration FFDM system by Siemens Healthcare, for example, provides screening, diagnostic, and stereotactic biopsy capabilities in a single system. However, the mammogram performed immediately prior to the MRI showed suspicious microcalcifications in the left breast, leading to the recommendation for a stereotactic biopsy, which demonstrated DCIS. The first-floor imaging wing is being expanded, including two digital mammography units, stereotactic biopsy equipment, and two ultrasound machines that will all be part of a women's health area, Mr. The new MAMMOMAT Novation(DR) meets the demands of modern mammography practices by providing digital screening, diagnosis, and stereotactic biopsy capabilities --all in one system.